Welcome to the High Hopes Hullabaloo. As some of you might know, High Hopes Rubber Stamps has a huge release coming up tomorrow. And as someone who already saw all of the new stamps...hahaha, let me tell you that they are absolutely gourgeous!! A lot of spring, easter and farm images. absolutely cute and versatile. Willkommen zum High Hopes Hullabaloo. Wie einige von euch sicher schon wissen wird High Hopes Rubber Stamps morgen eine Reihe von neuen Stempeln herausbringen. Und als jemand, der alle schon gesehen hat...hahaha ;) kann ich euch nur sagen, dass sie absolut putzig sind. Es gibt einiges für den Frühling, für Ostern und ein Farm Thema. I sewed the lace to the pink pirouette cardstock. The paper is from My Mind's eye and I used my Spellbinder's Piercabilities to cut the wavy part at the bottom. Ich habe die Spitze direkt an den cardstock genäht. Das Papier ist von My Mind's Eye und die geschwungene Kante habe ich mit Spellbinder's Piercabilities und meiner Cuttlebug gemacht. I coloured the bunny with Copic Sketch Markers. You can see a photo of the colours I used below. Ich habe den Hasen mit Copic Sketch Stiften coloriert. Unten seht ihr ein Photo von den Farben, die ich benutzt habe. The Whiff of Joy Medieval release is up!!! Have a look at all the images in the Whiff of Joy online store. The Whiff of Joy Guest Gesigner Call will start on Wednesday 18th, stay tuned for all the info! woww Katharina,what a beautiful card. 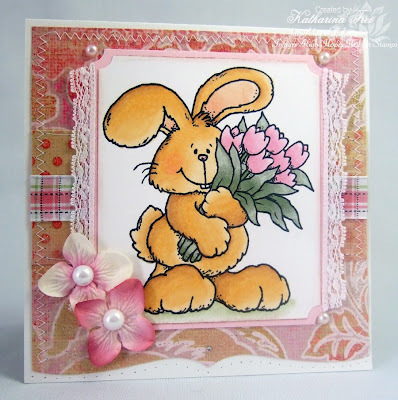 Gorgeous card - I can see why you love this bunny so much - he is adorable!!!! Can't believe it is almost time for a new GD call already! Der Hase ist aber auch wirklich total putzig und die Karte ein echter Hingucker. 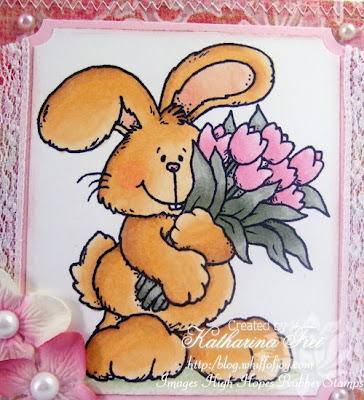 Stunning card Katharina! I really love your colouring and that bunny is just adorable! Great card and oh my what a huge bunny. Love the piercability edge. This is so adorable! I absolutely love it! I haven't had a chance to ink this one up yet. Die Karte ist ja mal wieder einfach genial geworden. Wow... was für eine "fantastische" Karte! so eine zucker suesse karte katharina. Such a cute bunny, and fantastic colouring as usual! die sieht ja auch genial aus!!! !